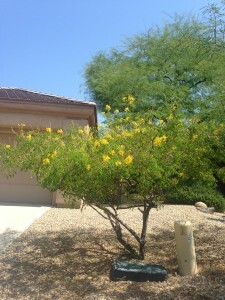 Tree trimming in Phoenix and the surrounding areas has never been easier thanks to Earthtones Landscape Management! Our tree thinning and tree trimming experts have years of experience caring for trees of all kinds. From Arizona’s very own Blue Palo Verde, Palm trees, Cypress trees, Chinese Elm, Mexican Palo Verde and more, Earthtones Landscape Management is your tree service in Phoenix. Find out what makes our Phoenix tree trimming and maintenance service so great by contacting us today for a no-cost, no-obligation quote! Tree trimming in Phoenix is a difficult, time-consuming job that can take you away from spending time with your family and friends on the weekend; why not have the professional landscapers from Earthtones Landscape Management handle your tree trimming and tree thinning needs? There are many important reasons for trimming and/or thinning a tree, including maintaining the tree’s overall health and appearance, restricting or stimulating growth, and even safety (weak or dead limbs falling can injure people or pets). Proper trimming, thinning and pruning ensures that your tree will lead a long, healthy life, so it’s critical that trained professionals take care of all of your tree maintenance in Phoenix. Earthtones Landscape Management has years of hands-on experience in tree trimming, thinning pruning and general tree maintenance. Let our professionals work to help you restore your property to its former glory by revitalizing its trees. The longer dead, dying or diseased limbs are left on a tree, the greater the chance of damage to the entire tree. Don’t let your investment fade away and wither without contacting us about our services. We’re happy to answer all of your questions and complete a potentially lifesaving operation as soon as possible! Simply give us a call or contact us and we’ll handle all of your tree maintenance and tree trimming in Phoenix, Scottsdale and the surrounding Valley-area cities. For more information on the other things we do for our customers, be sure to check out our Landscaping Services page to see all that we have to offer.